SUBHEAD: Technology won’t save us. Systemic change driven by moral awakening is our only hope. 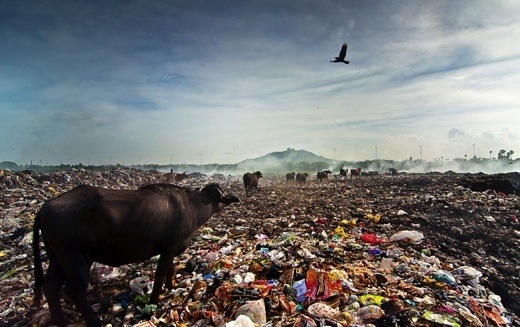 Image above: A herd of cows cross a landfill landscape in India. Photo by Saravanan Dhandapani. From (https://ecobnb.com/blog/2014/10/earth-overshoot-day/). Our core ecological problem is not climate change. It is overshoot, of which global warming is a symptom. Overshoot is a systemic issue. Over the past century-and-a-half, enormous amounts of cheap energy from fossil fuels enabled the rapid growth of resource extraction, manufacturing and consumption; and these in turn led to population increase, pollution and loss of natural habitat and hence biodiversity. The human system expanded dramatically, overshooting Earth's long-term carrying capacity for humans while upsetting the ecological systems we depend on for our survival. Until we understand and address this systemic imbalance, symptomatic treatment (doing what we can to reverse pollution dilemmas like climate change, trying to save threatened species and hoping to feed a burgeoning population with genetically modified crops) will constitute an endlessly frustrating round of stopgap measures that are ultimately destined to fail. The ecology movement in the 1970s benefitted from a strong infusion of systems thinking, which was in vogue at the time (ecology—the study of the relationships between organisms and their environments—is an inherently systemic discipline, as opposed to studies like chemistry that focus on reducing complex phenomena to their components). As a result, many of the best environmental writers of the era framed the modern human predicament in terms that revealed the deep linkages between environmental symptoms and the way human society operates. Limits to Growth (1972), an outgrowth of the systems research of Jay Forrester, investigated the interactions between population growth, industrial production, food production, resource depletion and pollution. Overshoot (1982), by William Catton, named our systemic problem and described its origins and development in a style any literate person could appreciate. Many more excellent books from the era could be cited. However, in recent decades, as climate change has come to dominate environmental concerns, there has been a significant shift in the discussion. Today, most environmental reporting is focused laser-like on climate change, and systemic links between it and other worsening ecological dilemmas (such as overpopulation, species extinctions, water and air pollution, and loss of topsoil and fresh water) are seldom highlighted. It's not that climate change isn't a big deal. As a symptom, it's a real doozy. There's never been anything quite like it, and climate scientists and climate-response advocacy groups are right to ring the loudest of alarm bells. But our failure to see climate change in context may be our undoing. Why have environmental writers and advocacy organizations succumbed to tunnel vision? Perhaps it's simply that they assume systems thinking is beyond the capacity of policy makers. It's true: If climate scientists were to approach world leaders with the message, "We have to change everything, including our entire economic system—and fast," they might be shown the door rather rudely. A more acceptable message is, "We have identified a serious pollution problem, for which there are technical solutions." Perhaps many of the scientists who did recognize the systemic nature of our ecological crisis concluded that if we can successfully address this one make-or-break environmental crisis, we'll be able to buy time to deal with others waiting in the wings (overpopulation, species extinctions, resource depletion and on and on). If climate change can be framed as an isolated problem for which there is a technological solution, the minds of economists and policy makers can continue to graze in familiar pastures. Technology—in this case, solar, wind and nuclear power generators, as well as batteries, electric cars, heat pumps and, if all else fails, solar radiation management via atmospheric aerosols—centers our thinking on subjects like financial investment and industrial production. Discussion participants don't have to develop the ability to think systemically, nor do they need to understand the Earth system and how human systems fit into it. All they need trouble themselves with is the prospect of shifting some investments, setting tasks for engineers and managing the resulting industrial-economic transformation so as to ensure that new jobs in green industries compensate for jobs lost in coal mines. The strategy of buying time with a techno-fix presumes either that we will be able to institute systemic change at some unspecified point in the future even though we can't do it just now (a weak argument on its face), or that climate change and all of our other symptomatic crises will in fact be amenable to technological fixes. The latter thought-path is again a comfortable one for managers and investors. After all, everybody loves technology. It already does nearly everything for us. During the last century it solved a host of problems: it cured diseases, expanded food production, sped up transportation and provided us with information and entertainment in quantities and varieties no one could previously have imagined. Why shouldn't it be able to solve climate change and all the rest of our problems? Video above: "Hello Humanity, it's me, Technology. We need to talk. ". From (https://youtu.be/1TerTgDEgUE). Of course, ignoring the systemic nature of our dilemma just means that as soon as we get one symptom corralled, another is likely to break loose. But, crucially, is climate change, taken as an isolated problem, fully treatable with technology? Color me doubtful. I say this having spent many months poring over the relevant data with David Fridley of the energy analysis program at Lawrence Berkeley National Laboratory. Our resulting book, Our Renewable Future, concluded that nuclear power is too expensive and risky; meanwhile, solar and wind power both suffer from intermittency, which (once these sources begin to provide a large percentage of total electrical power) will require a combination of three strategies on a grand scale: energy storage, redundant production capacity and demand adaptation. At the same time, we in industrial nations will have to adapt most of our current energy usage (which occurs in industrial processes, building heating and transportation) to electricity. Altogether, the energy transition promises to be an enormous undertaking, unprecedented in its requirements for investment and substitution. When David and I stepped back to assess the enormity of the task, we could see no way to maintain current quantities of global energy production during the transition, much less to increase energy supplies so as to power ongoing economic growth. The biggest transitional hurdle is scale: the world uses an enormous amount of energy currently; only if that quantity can be reduced significantly, especially in industrial nations, could we imagine a credible pathway toward a post-carbon future. Downsizing the world's energy supplies would, effectively, also downsize industrial processes of resource extraction, manufacturing, transportation, and waste management. That's a systemic intervention, of exactly the kind called for by the ecologists of the 1970s who coined the mantra, "Reduce, reuse and recycle." It gets to the heart of the overshoot dilemma—as does population stabilization and reduction, another necessary strategy. But it's also a notion to which technocrats, industrialists, and investors are virulently allergic. The ecological argument is, at its core, a moral one—as I explain in more detail in a just-released manifesto replete with sidebars and graphics ("There's No App for That: Technology and Morality in the Age of Climate Change, Overpopulation, and Biodiversity Loss"). Any systems thinker who understands overshoot and prescribes powerdown as a treatment is effectively engaging in an intervention with an addictive behavior. Society is addicted to growth, and that's having terrible consequences for the planet and, increasingly, for us as well. We have to change our collective and individual behavior and give up something we depend on—power over our environment. Image above: In 1961 we were consuming 74% of the Earth's sustainable resources. By 1985 we passed 100% of a sustainable rate. In 2012 we passed 150% of sustainable levels. 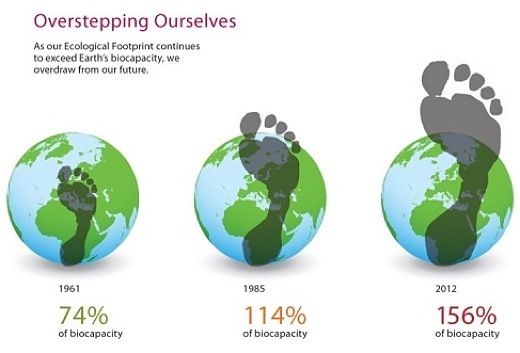 Check out your footprint here (https://www.footprintcalculator.org/#!/). From (https://ecobnb.com/blog/2014/10/earth-overshoot-day/). We must restrain ourselves, like an alcoholic foreswearing booze. That requires honesty and soul-searching. In its early years the environmental movement made that moral argument, and it worked up to a point. Concern over rapid population growth led to family planning efforts around the world. Concern over biodiversity declines led to habitat protection. Concern over air and water pollution led to a slew of regulations. These efforts weren't sufficient, but they showed that framing our systemic problem in moral terms could get at least some traction. Why didn't the environmental movement fully succeed? Some theorists now calling themselves "bright greens" or "eco-modernists" have abandoned the moral fight altogether. Their justification for doing so is that people want a vision of the future that's cheery and that doesn't require sacrifice. Now, they say, only a technological fix offers any hope. The essential point of this essay (and my manifesto) is simply that, even if the moral argument fails, a techno-fix won't work either. A gargantuan investment in technology (whether next-generation nuclear power or solar radiation geo-engineering) is being billed as our last hope. But in reality it's no hope at all. The reason for the failure thus far of the environmental movement wasn't that it appealed to humanity's moral sentiments—that was in fact the movement's great strength. The effort fell short because it wasn't able to alter industrial society's central organizing principle, which is also its fatal flaw: its dogged pursuit of growth at all cost. Now we're at the point where we must finally either succeed in overcoming growthism or face the failure not just of the environmental movement, but of civilization itself. The good news is that systemic change is fractal in nature: it implies, indeed it requires, action at every level of society. We can start with our own individual choices and behavior; we can work within our communities. We needn't wait for a cathartic global or national sea change. And even if our efforts cannot "save" consumerist industrial civilization, they could still succeed in planting the seeds of a regenerative human culture worthy of survival. There's more good news: Once we humans choose to restrain our numbers and our rates of consumption, technology can assist our efforts. Machines can help us monitor our progress, and there are relatively simple technologies that can help deliver needed services with less energy usage and environmental damage. Some ways of deploying technology could even help us clean up the atmosphere and restore ecosystems.